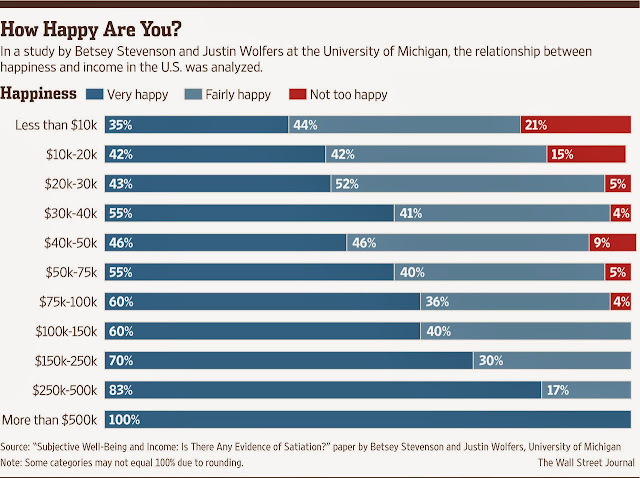 Excellent article in the Wall Street Journal this week titled: Can Money Buy You Happiness? "In short, this latest research suggests, wealth alone doesn’t provide any guarantee of a good life. What matters a lot more than a big income is how people spend it. For instance, giving money away makes people a lot happier than lavishing it on themselves. And when they do spend money on themselves, people are a lot happier when they use it for experiences like travel than for material goods. In a study published earlier this year, he found that people think material purchases offer better value for the money because experiences are fleeting, and material goods last longer. So, although they’ll occasionally splurge on a big vacation or concert tickets, when they’re in more money-conscious mode, they stick to material goods. But in fact, Prof. Howell found that when people looked back at their purchases, they realized that experiences actually provided better value."